The Capers: All 338 units of the Tower Blocks were snapped up in 2-Day preview. YTL Land & Development’s Sentul West & Sentul East continues to captivate the market as the preview of the first release of its newest residential development – The Capers exceeded expectations to become a sell-out success in just two days. The teeming crowd made up of YTL valued buyers and registrants were seen rushing to stake a claim in the units priced between RM688,519 to RM3,284,086, from the preview which opened on Friday, 25 March and by the end of the second day, all 338 units of the tower blocks were snapped up. Commenting on the staggering results, YTL Land & Development Berhad executive director Datuk Yeoh Seok Kian said, “We knew the response to The Capers was going to be good as more than 7,000 people had earlier registered their interest with us, but we certainly did not expect to have a sell-out story in our hands ahead of the official launch. This is a clear sign of buyers’ confidence in Sentul, and our appreciation goes out to them for their continued support. Not only are they buying into the YTL promise of quality branded homes with unique concepts, they are also investing in the future of Sentul West and Sentul East which through our master plan has already started transforming the landscape of this heritage town. The Capers is the third residential development to be launched in Sentul East, following The Tamarind and The Saffron. Standing tall at 36 storeys, the two towers of The Capers is set to alter Sentul’s already changing skyline and bring a new lease of energy with its wave-like iconic design that takes its inspiration from nature where nothing ever conforms to a straight line. “The design of The Capers is certainly something that KL has not seen before that we’re proud to bring to Malaysians for the first time. We are raising the benchmark in terms of architecture and design, not only to contribute to KL’s goal of becoming a world -class city, but more importantly to contribute towards the transformation of Sentul under our vision of urban renewal,” said Datuk Yeoh. “In spite of the new price standard, we have continued to sustain the interest of the market with The Capers, proving the underlying strength of Sentul as KL’s next property hotspot.” The Capers registers a new price benchmark for Sentul properties selling at an average of RM550 - RM600 per sq ft.
Datuk Yeoh added that the preview of The Capers will continue with the opening of its pool-facing 5-storey low rise suites that sit on the podium floor of the iconic towers. Comprising duplex units (4+1=1 bedrooms at 1,965 sq ft) on the ground floor and three levels of single suites at 999sq ft with 2+1 bedrooms, the low rise offerings of The Capers is expected to mirror the success of the tower block units. “Through the years, we have also established a strong capital appreciation track record for our Sentul properties. The Saffron for example was launched in 2006 at RM220psf, and today it’s valued between RM450 to RM500 per sq. ft. Similarly, The Maple is currently valued at an average price of RM500 per sq. ft, which translates to 100% of its launch price in 2003. This is a true test that a unique product, can weather any economic cycle." Already in demand for its quality homes, Sentul is also shaping itself as the city’s next business precinct featuring a new generation of architecturally stunning offices that redefines the traditional office model. Sentul East’s commercial offerings include the recently completed d7 and soon-to-be completed d6 boutique offices project that have taken the market by storm. And soon, YTL Land & Development will be launching d2 and d5, raising the bar even higher in terms of architectural concept. “Ultimately, we are creating unprecedented living values for city dwellers through our developments. On one hand we have Sentul West, which leads the creation of the city’s first private park homes through Sentul Park, a 35-acre private gated green lung, and on the other Sentul East is a chic and cool urban space that is fused with the colourful heritage of Sentul,” said Datuk Yeoh. 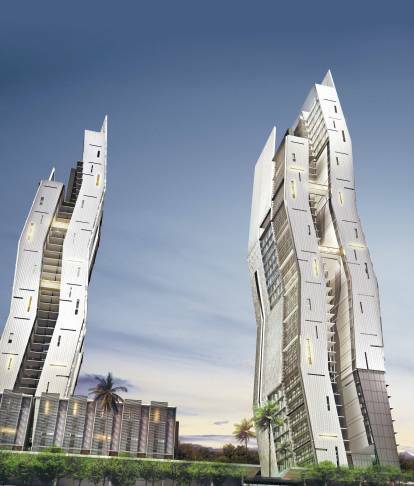 The RM350 million Capers project comprises two 36-storey iconic towers that enjoy panoramic views of the city skyline and Sentul Park, and low-rise suites that further provide one with the ultimate in urban living. At six units per floor, the two towers has 338 units in total while the low rise suites are made up of 128 units. The Capers is located within walking distance of the Sentul Timur LRT station and the Sentul KTM Komuter where within 15 mins, one can connect directly from KL Sentral to KLIA via the 28-min KLIA Ekspres train. In addition, three highways (Sentul Link, Duta-Segambut and DUKE which is accessible from the north of Sentul) ensure smooth connectivity to all parts of the city. For more information, please visit www.capers.com.my. AN INTERNATIONAL technology and commercial centre (ITCC) is being developed in Penampang that will transform the economy of the town in the suburb of Kota Kinabalu. Built with a capital investment of RM300 million, the ITCC is undertaken by Bumiputera-owned Sabanilam Enterprise Sdn Bhd, a subsidiary of Malakun Holdings owned by Datuk Seri Clarence Bongkos Malakun. The project will include the development of a business hotel, an office tower hotel, a modern shopping mall with hi-fi facilities, theatre and science and technology exhibition area. Officiating at the ground-breaking ceremony of the project, Chief Minister Datuk Seri Musa Aman said the ITCC is listed as a private sector initiative project by the Sabah Economic Development and Investment Authority (Sedia), the one-stop authority for the Sabah Development Corridor (SDC). Musa said the ITTC reflects the capabilities of Bumiputera company to undertake big projects. "Both the state and federal government are continuously encouraging Bumiputera entrepreneurs to initiate and participate in projects that could help spur economic growth in Sabah," he said. Malakun said site preparation for the ITCC project located at Jalan Pintas in Kampung Hungab, Penampang, has been completed and that piling works would begin soon. "We expect the project to be completed in 40 months," he said. Rebak Island Resort, on a 158ha private island off Langkawi, is planning to enhance the island to attract more guests. The resort, 75 per cent-owned by DRB-HICOM Bhd's unit Hicom Indungan Sdn Bhd, is looking at developing private beaches for guests and opening a wellness spa. Rebak Island Resort, in which Langkawi Development Authority and Mofaz have a 19 per cent and 6 per cent stake respectively, is managed by Indian luxury hotel chain Taj Hotels Resorts and Palaces. General manager Mahesh S. Aiyer said these plans are likely to be completed in the next two to three years. "Rebak is a unique private island. In sync with the positioning of a private island, we need to extract the potential of the island," he said during an interview with Business Times. For a start, it plans to open an additional restaurant serving Asean and Japanese cuisine. It is also looking at a yoga retreat and a restaurant serving organic food. Subsequently, it may also develop two private beaches and set up a spa complex aimed at capturing not only guests from its resorts but also tourists from the main island. Rebak Island, he said, will be transformed into a rejuvenation spot where unique activities can be conducted such as a cooking holiday and for photography enthusiasts.